In the landscape of television, public access has always been the equivalent to the wild, wild west. You will see and hear things that you would never see on “regular” or “for pay” television. It’s a field that many an artist and personality has created and prospered in. One man that fits this bill oh so nicely is Art Fein and his long running Los Angeles access show, Art Fein’s Poker Party. Billed as a “rock & roll talk show” and running since 1984, Fein’s likable personality coupled with a history of stellar guests, including Brian Wilson, Jeffrey Lee Pierce, Richard Carpenter and the Legendary Stardust Cowboy have all helped make Poker Party a cult favorite. 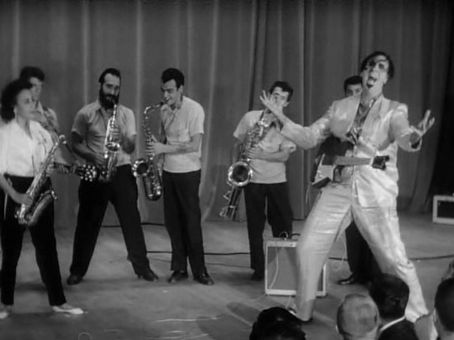 But like a Cajun dancing Elvis from Hell, it was one guest in particular that made Art Fein’s Poker Party history. On June 12th, 1989, along with Paul Body, Richard Blackburn (director of Lemora: A Child’s Tale of the Supernatural, a film I cannot recommend enough) and host Fein himself, was the man, Timothy Agoglia Carey. Carey, famous for his unforgettable turns in films like Stanley Kubrick’s The Killing and Paths of Glory, as well as John Cassavetes’ The Killing of a Chinese Bookie, had already long-earned the reputation of wild card by the time of this episode’s taping. This nearly six minutes of pure brazen gold plays out like a gift for anyone in the know of this not nearly heralded enough artist and true blue genius. In fact, it is so good that it is also a great introduction to the charisma and beautiful madness that was and forever is Timothy Carey for the uninitiated. Here, Carey talks about his work with Cassavetes, as well as briefly his own film, the incomparable rock & roll religious parable of sorts, The World’s Greatest Sinner. Even better is Carey’s recollections of his work in both the campy AIP (American International Pictures) classic, Beach Blanket Bingo, as well as his last mainstream feature film, Echo Park. While neither description is entirely accurate, both actually would have made said films even better, between his talk of murder-by-bongos or women literally weeping from the painful indigestion after eating his character’s pizza. 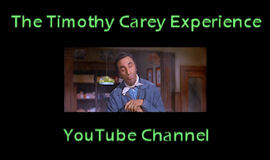 It makes one yearn for an entire universe as seen through Timothy-Carey-Vision. Dreaming is free but in the meantime, we at least thankfully have this great clip courtesy of Art Fein’s Poker Party. This week’s video is truly a treat. This is one of several of Timothy’s appearances on Art Fein’s Poker Party, the long-running Los Angeles cable access program. This one was first aired on June 12, 1989. If you had any doubts that Tim was truly a force of nature off-screen as well as on-, this should dispel those doubts right now. I wish I could have just sat at his feet and listened to him go on like this for hours.